With SVITZER MILFORD in drydock in Liverpool and SVITZER MALLAIG still at Milford Haven, another of the company's tugs has been drafted in to assist AYTON CROSS and ANGLEGARTH. 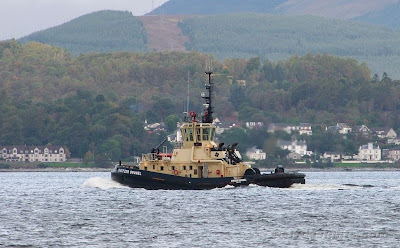 Unusually, SVITZER BRUNEL appears to have been using Fairlie Quay as a base, and it was to there that she was returning on Sunday morning after assisting with a shipping movement upriver. SVITZER BRUNEL is more usually found, as her name might suggest, working at Avonmouth Docks. She dates from 2003, when she was delivered to Svitzer from the Zamacona yard in Spain. Fitted with two Niigita azimuthing thrusters, the 29.5 metre long tug has a bollard pull of 60 tonnes.